Turns out drinking down several cups of coffee every morning offers more benefits than just waking up your system! According to a new study published in the Journal of Neurology, Neurosurgery & Psychiatry, people who drink lots of coffee may have a lower risk of multiple sclerosis. Multiple sclerosis is an autoimmune disease that arises when arises your immune system mistakenly attacks the protective sheath around nerve fibers in your brain and spinal cord. Depending on where the damage occurs, you can suffer numbness, vision problems, muscle weakness as well as difficulty with balance and coordination. 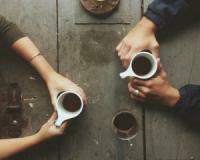 To learn more about how drinking lots of coffee may be tied to a lower risk of multiple sclerosis, keep reading. The study was led by Anna Hedstrom of the Karolinska Institute in Stockholm, Sweden. Hedstrom and her team looked at 6,700 people in total, who they divided into two study groups: A Swedish group that included 1,620 people with multiple sclerosis and 2,788 without the disease as well as a US group of 1,159 multiple sclerosis patients and 1,172 adults free of the disease. They found that among these 6,700 people, those who downed six cups of java per day were almost 75% less likely to develop multiple sclerosis than non-coffee drinkers were. The team noted that the link wasn’t explained away by factors such as people’s age, smoking or drinking habits, income levels of education. Hedstrom stressed that these findings don’t prove that high doses of caffeine fight multiple sclerosis, nor is anyone suggesting that people should drink more coffee to stave off the autoimmune disease. Hedstrom said the findings don’t provide solid proof that coffee “may have beneficial effects on our health” – but there’s no way to make specific recommendations. Elaine Kingwell, a researcher at the University of British Columbia in Vancouver, Canada, agreed. All of that said, Hedstrom and Kingwell agreed that there’s reason to believe that drinking coffee may protect against multiple sclerosis. Slash your risk of multiple sclerosis by 45% by eating fish regularly! Three foods multiple sclerosis patients should avoid at all costs!